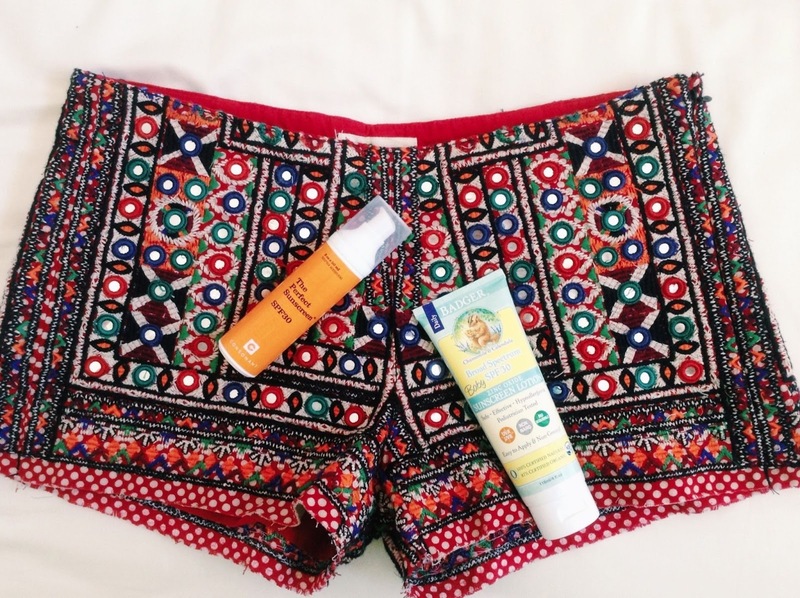 I am obsessed with practicing safe sun all year round, but especially when the sun is so blazing hot that you feel like the heat itself could give you a sunburn, I believe a pair of awesome shorts and sunscreen are more essential than ever. I may be a California girl, and home may be where the sun is, but sun damage ain’t pretty. Neither are chemical sunscreens containing ingredients like oxybenzone, which scores an 8 on the Skin Deep Database for biochemical or cellular level changes and endocrine disruption. Luckily, there are physical sunscreens containing ingredients like zinc oxide and titanium dioxide which are much safer for the skin. While Prevention Mag says sunscreen is the ultimate anti-aging cream, and Rose Marie Swift of RMS beauty prefers the sun sunscreen-less*, I will slather on my SPF 30’s just to be safe and balance sun exposure with sun protection the best I can. The name sets it up too well because this is a perfect sunscreen. It’s hydrating without leaving any white cast, irritation, or greasiness. It has a slight aloe scent and a slight tint–just enough to barely even out skin tone, but not too much to feel heavy or classify it as a tinted moisturizer. On good skin days, I have gone out of the house with just this and the beautiful Kjaer Weis mascara–a very natural and glowing look. As far as application goes, one pump dispenses enough for my face and neck post-moisturizing and pre-makeup. I’ve used sunscreens from Badger and Devita before, both of which had their upsides and downsides, but this one from Consonant is my favorite–every point about it is lovely! Also, I bought two more during their recent flash sale celebrating their newly redesigned site to give to my mum and sis. Star ingredients: non-nano zinc oxide, titanium dioxide, aloe juice, rice bran oil, grape seed oil. While I am zealous about applying sunscreen to my face, I am not as responsible with my body, even though, ironically, a larger amount of skin covers my body than my face. When my watch tan started becoming obvious and even my manager commented how I was getting tanner**, I knew I had to get on a proper, daily body sunscreen. I’ve used Badger sunscreen on my face and body in the past, and while the ingredients were stellar, I had to take more time with application to pat pat away the white cast. Their newer formulation with aloe makes the formula much more manageable with minimal to no white cast. I still find that if I’m not properly moisturized, I will look a bit flaky, so I manage that by mixing the sunscreen with a moisturizer, rosewater mist, or body oil (coconut is my favorite). I apply to all the body areas I know will be exposed once I take off my long-sleeve layers after work–it’s fall/winter all year long in there–and try to reapply after I get in the car to go home. The chamomile and calendula scent isn’t too overwhelming, and I’ve heard the orange and vanilla scent smells like orange creamsicles. I have the baby version since Whole Foods was out of the normal version at the time, but hey, I want baby-soft, protected skin too! Star ingredients: non-nano uncoated zinc oxide, aloe juice, sunflower oil, calendula extract. Tl;dr Not a burn in sight with these two sunscreens. 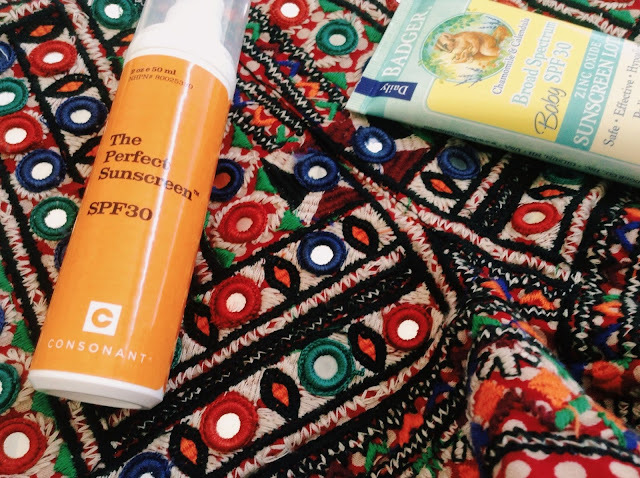 What sunscreens are you loving this summer? * See EWG’s “9 Surprising Facts about Sunscreen” and NaturalNew’s “7 Surprising Things You’re Not Supposed to Know About Sunscreen and Sunlight Exposure” if you want more on the sunscreen debate. ** I replied it was from driving the car to work. Who goes to the beach? Also, my left side is slightly tanner than my right side. Awkward. Can I first just say I FREAKING LOVE YOUR SHORTS U$)(@U$)(U$)(! I am obsessed. And because of you, I want that consonant sunscreen more and more! Do you use it as your day moisturizer too then? I love this Consonant sunscreen and I've got my sister hooked on it as well! I am too obsessed with my face oils, so I still use a face oil as a moisturizer, and then I apply the Consonant sunscreen. Wonderful moisturizing duo. Devita used to make my skin drier, even when layered over a face oil!